Having had a different sort of weekend, I thought it was probably time for an update. Rather than our usual culture-fest we spent most of Saturday, and half of Sunday, trekking around parts of New Jersey and Queens. Our aim is to find somewhere new to live when our current lease expires in the Autumn – we love the Upper East Side but it is a little pricey, plus after almost two years in the same place (two years!) it seems like a good time to try a different area – so we wanted to visit a few cheaper neighbourhoods and see what we thought of them. Mostly we eliminated options from the list, but we do have one or two possibilities to investigate further, so watch this space…! Of course, there’s always time for more cerebral pastimes too, and last week I fitted in a couple of quick visits to an exhibition about Guastavino tiles and the Met’s show of Charles James couture. 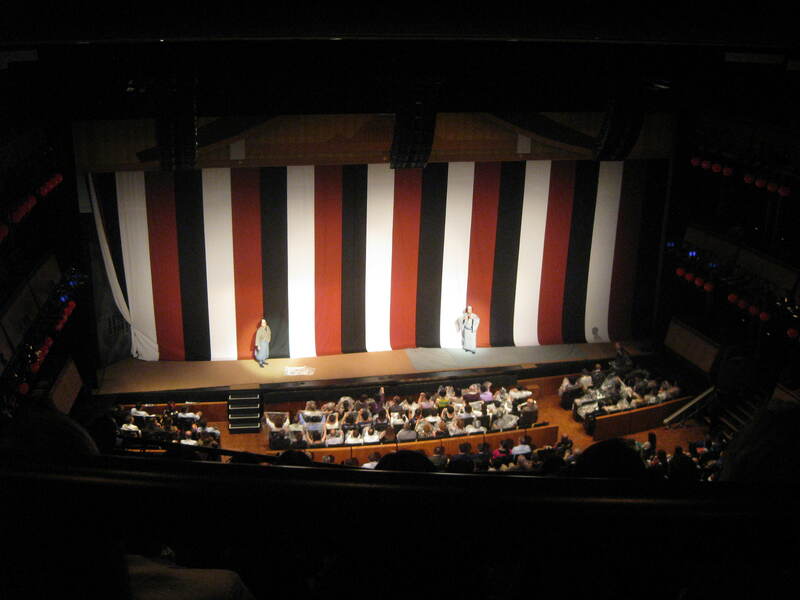 However, the week’s main highlight was Friday night at a Japanese Kabuki play, Kaidan Chibusa no Enoki. Performed by the Heisei Nakamura-za theatre company, the title translates as The Ghost Tale of the Wet Nurse Tree. 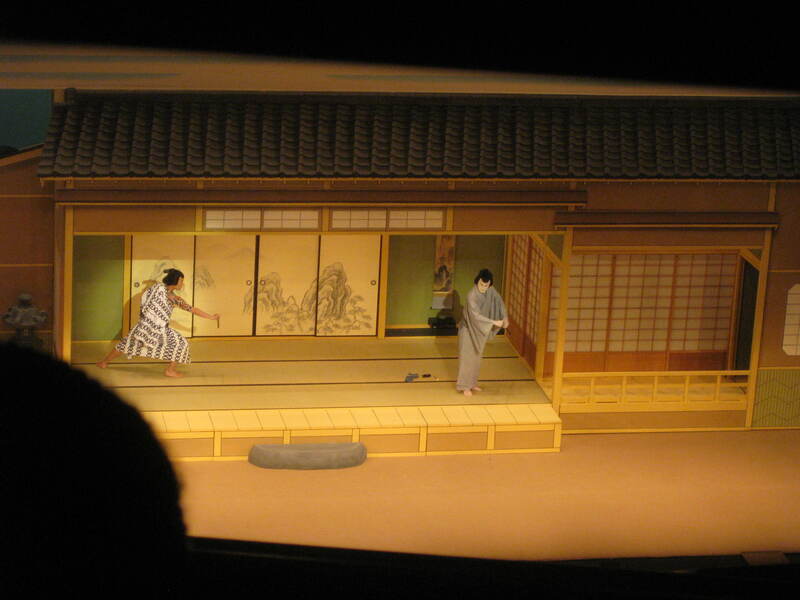 A review in TimeOut summarizes the piece perfectly: “A villainous samurai falls in love with a married woman, kills her husband and nearly murders her son” in “an epic tragicomedy” which “combines slapstick, abstract fight sequences and the dramaturgical and moral crudeness of melodrama, interspersed with clowns distracting the audience as stagehands install elaborate scenery”. Despite having the cheapest possible seats in the second row from the back of the balcony, we had a great view of the stage. 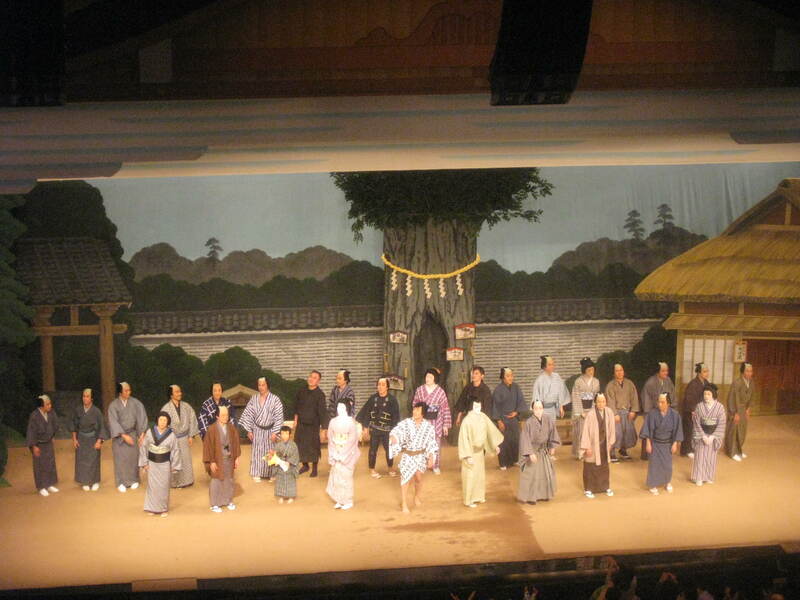 This was fortunate as the sets were beautiful, completely reminiscent of Japanese paintings, and we could also see most of the actors’ dramatic facial expressions. The performance was in Japanese, but the language barrier was overcome by a live translation delivered via individual headsets which we all collected on the way in. 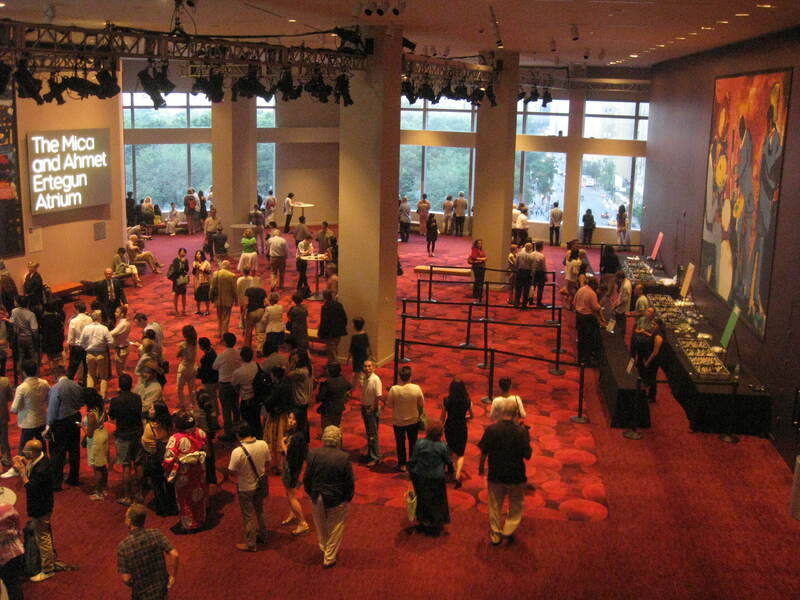 The acting was rather stylized, combining elements which reminded us of Restoration comedy, or even pantomime. With some incredible split-second timing, one actor played three different roles – this was mostly achieved by super-fast costume changes, but body doubles were also involved in a fight between two of his characters, which is brought to a conclusion by the intervention of the third, though with a kind of cups-and-balls trick mystery, the character he was playing at the end of that scene was not the one I thought he was! 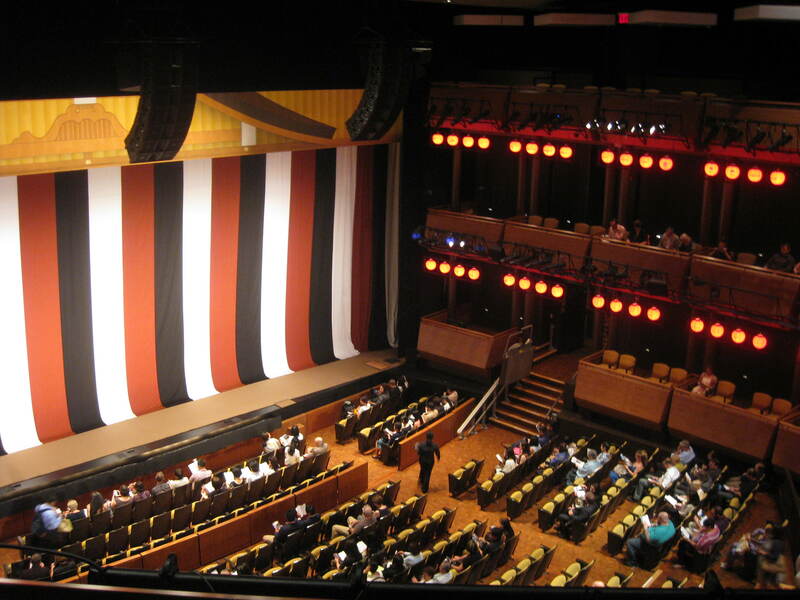 Judging by the laughter and applause coming from the Japanese in the audience (of whom there were many, some beautifully attired in kimono) there were plenty of jokes or cultural references that we were missing, but it was still a thoroughly enjoyable evening’s entertainment. And walking home past a moonlit Central Park was rather lovely too – a treat which I shall miss once we’ve moved. This entry was posted in Exploring, Living and tagged Charles James, couture, Guastavino, Hoboken, kabuki, Lincoln Center Festival, New Jersey, Queens, Rose Theater, theatre, tiles by Emma Davidson. Bookmark the permalink.